Model: The coaches have the new, longer length. The minimum radius for operation is 360 mm / 14-3/16. The underbodies are specific to the type of car. The trucks come with brake shoes and separately applied generators. 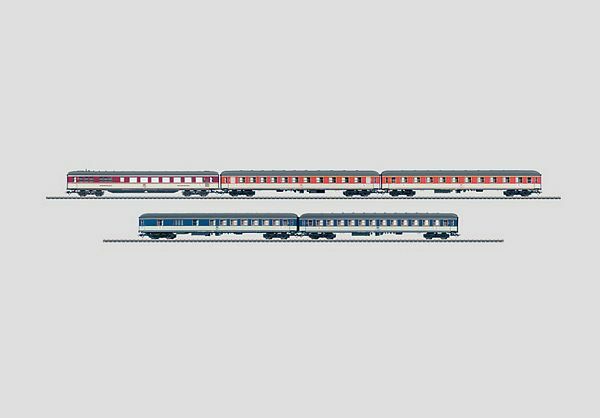 The cars are ready for installation of the 7319 current conducting couplings or the 72020/72021 current conducting couplers, the 73406 pickup shoe, the 73400/73401 lighting kit (2 per car), and the 73409 marker light kit. The dining car has the correct scale length. The underbody is specific to the type of car. The trucks are a Minden-Deutz heavy design. The car is ready for installation of the 7319 current conducting couplings or the 72020/72021 current conducting couplers. Total length over the buffers 139.8 cm / 55-1/16.